Steele Canyon Golf Club has become one of the top rated Wedding Venues in San Diego for the beautiful setting that surrounds you coupled with the way we provide a constant source of ideas and support throughout the planning and final details of your very special day. Set in the surrounding community of Steele Canyon estates, we feature a public facility in a Private, Members only setting. The drive alone into this exclusive setting will make you feel like you are coming into a private estate. We are conveniently located in Rancho San Diego just minutes from downtown and off the 94 freeway. We feature a beautiful, recently remodeled clubhouse and our main event venue is our also recently remodeled Pavilion with added “Sunset Deck” which takes in the most magnificent views on the property. 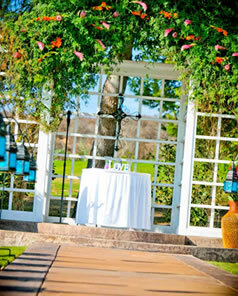 The ceremony arbor takes in a wide ranging view of the golf course and the surrounding hills of Ranch San Diego. Our location in Rancho San Diego offers easy access from all directions. Parking is ample without charge. 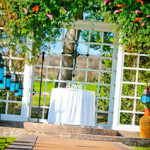 As one of the top rated San Diego wedding locations, Steele Canyon Golf Club has built a reputation over the years of providing an incredible setting coupled with extraordinary service and support on a consistent basis. From the moment you first visit our facility, you will be treated just the way you feel; like this is the most important time of your life! We are committed to partnering with you to cover all the important details of planning your special day. When that day arrives, we will be right there with you to see that your day goes seamlessly and just the way you imagined. You’ll be delighted with the comments you will receive from family and guests alike, not to mention the feeling you will have, knowing that we are there to see to the details so you can focus on enjoying your wedding day. Our San Diego outdoor wedding venues offer selections from moderately priced options right up to the finest dining, complete with all of the essential ingredients you will need. 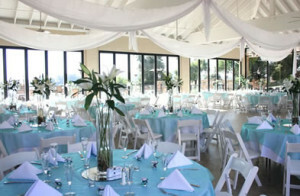 We include tables, chairs, linen, setup and cleanup all with no additional fees. We provide an appetizer for your guests to enjoy during the cocktail hour, champagne toast, complete beverage station and we do not charge an additional fee for cake cutting and service. Our San Diego outdoor wedding venues ceremony packages offer complete setup of the ceremony arbor, use of our bridal changing room and your rehearsal. For your convenience we also offer a specialized menu if you would like to host your rehearsal dinner at the club afterward. To satisfy your visual impressions and your palate, we hold frequent open house events where we set up as we do for our weddings so that you get a great visual impression of the venue. At these events we also offer a complimentary food tasting featuring a selection of the items that are on our reception menus. You will have a chance to taste firsthand the wonderful quality and selection of food that Steele Canyon offers at all of our catered events. We invite some of our favorite wedding vendors to be on hand to answer questions, provide insights and share their experience as a wedding professional at Steele Canyon. Most of the couples that attend feel like they have made great strides in the planning process after attending one of these events. It’s just another part of the full range of service that we provide for all of our wedding couples. Being one of the premier San Diego wedding locations, you will find our San Diego wedding location to be an amazing place. Let Steele Canyon offer its warmth and leave your guest with an extraordinary affair.